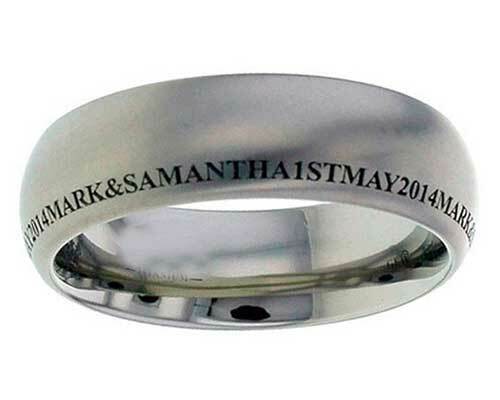 Domed Personalised Wedding Ring : LOVE2HAVE in the UK! A domed profile personalised wedding ring made from titanium. Here is a 7mm width domed profile titanium wedding ring that comes with your very own personalised message. The personalised engraving is positioned off centre towards one edge of the ring and is laser engraved. The personalised engraving included in the price is FREE! Just enter your requirements into the comments box at check out. We offer two fonts of either Arial or Times, and the ring pictured is only one example, but you can have anything you wish. Returns Policy: This UK made wedding ring is personalised and made to order so, therefore, non-returnable unless faulty or not as described. Please see our terms and conditions.